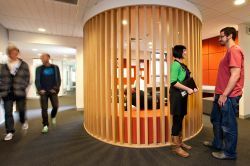 La Trobe University > Research > Get a research degree > Which graduate research degree is right for you? La Trobe University offers graduate researchers three types of research degree, depending on your goals, and your educational and professional background. The award of a PhD degree depends on the examination of a completed thesis of typically 80,000 words or less (although there can be differences depending on your field of research). The expected period of study is 39 months full-time (with a maximum period of study of 4 years full-time), or part-time equivalent, and candidates must gain through their studies (and demonstrate in their thesis) a substantial body of knowledge at the frontier of a field of work or learning, including knowledge that constitutes an original contribution. Our La Trobe PhD may be tailored to provide candidates with more industry experience. Find out more. This degree can also be undertaken in practice-based mode or as a thesis with publications. This type of degree consists of research towards completion of a thesis with a requirement to complete some coursework, normally in the first year of enrolment. The award of the degree depends on the examination of the completed research thesis of typically 60,000 words or less. The completion of core subjects may be a requirement for satisfactory academic progress in some professional doctorates. The expected period of study is 39 months full-time (with a maximum period of study of 4 years full-time), or part-time equivalent, and candidates must make an original and substantial contribution of direct relevance to their profession (in the case of the Doctor of Juridical Science a substantial and original contribution to knowledge in the context of professional practice). The award of the degree depends on the examination of a completed thesis of typically 50,000 words or less. The expected period of study is 20 months full-time (with a maximum period of study of 2 years full-time), or part-time equivalent, and candidates must gain through their studies (and demonstrate in their thesis) a body of knowledge that includes the understanding of recent developments in one or more disciplines. We are always seeking to improve our research degrees in order to ensure the best quality outcome for candidates. The following page details newly developed or significantly revised graduate research degrees.